Sadly, this precious wheelbarrow was not for sale...and the gardeners were on the lookout, so I couldn't just (very casually) roll it away...! I was in Colonial Williamsburg recently, and had fun taking photos of what the historic preservation gardeners are planting in their early spring gardens! I spotted a number of different plants growing in the gardens: onions, garlic, herbs, lettuces, carrots, turnips, parsnips, endives, and clover (as a winter cover crop). The gardens were dotted with lovely glass bell jars, which were used to insulate baby plants from early spring frost (this is a great piece on the gardens of Williamsburg, with more detail on colonial gardening methods). 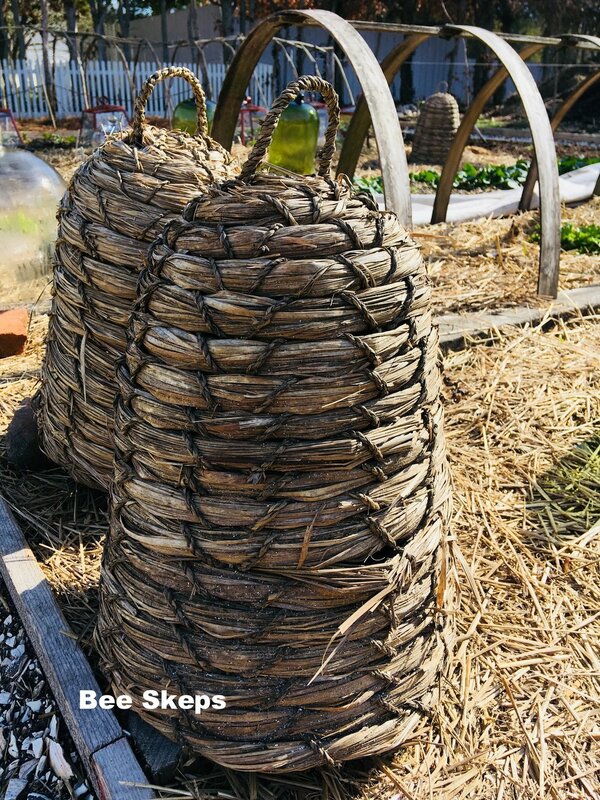 Woven bee skeps, which would have been used as bee hives during the colonial period but are no longer used today (beekeepers had to kill all the poor bees to get the honey with this method) add an ornamental flair. The red lantern-looking contraptions providing frost protection for endives in the garden have me stumped: I have no idea what they're called, but the top rotates so the excess heat can escape during the day, thus preventing the lettuce from getting fried on sunny days. You can click on any of the photos in this piece to enlarge them, scroll through and read my notes! In their cold frames, the gardeners were starting cauliflower and many different kinds of lettuce. Here are a couple more photos of these lovely gardens, which will be bursting with flowers and produce in a few short months (you can see what they will look like by May in my article here). Isn't that wheelbarrow pretty?? I love that green color. Much more picturesque than the one I own, Lowe's practical in all its black plastic and rubber. Useful? yes. Aesthetically pleasing? No. This garden is making me absolutely pine for a house with a yard. I miss gardening so much. If you (like me) are living in multi-family housing with no place to garden, then you can enjoy this vicarious gardening experience with me! Spring is on its way, and with it (if you have a sunny patch of lawn) all the fun of starting new garden projects: please click on the links that follow for my articles on my favorite seed catalogs, seed-starting, and the history of the kitchen garden!